That’s right, there are only three statements, well, forms of statements that can heal everything. They are 1) I forgive myself (for believing)... 2) I forgive others (whoever that person(s) is in your life that you need to forgive)… and 3) I give others permission to forgive me (when I hurt them the same way I was/am/hurt)… Combining these statements together creates holistic, past, present, and future healing. For example, when something bad happens to me, or I make a mistake, it may cause me to believe something negative about myself that reinforces repetition of the issue. If I believe I am a victim, I may continue to be victimized. If I believe I am unloveable, I will not feel love. If I believe I have no control, I may constantly be looking for places in my life where I can control. Until I forgive myself for believing these negative things about myself, how can I heal from them? How can I get over them? Even if someone else supported the cause of these negative belief patterns, I still have the power to forgive and let go of how I treat myself regardless of how someone else treats me. Forgiveness of self empowers and helps survivors completely heal. There is often opposition to forgiveness in abusive situations, that is to say, if I forgive, I will continue to be hurt or victimized. Forgiving oneself protects against this, because as soon as I let go of and forgive the belief that I deserve a certain situation, or that it’s my fault, or that I can’t change, I am able to walk away and potentially break the cycle. And all this can happen before even considering the next statement! Think about what you might believe to keep you in negative patterns, pain, and illness, and forgive yourself for believing it. This is what most people think of when they think of forgiveness. Take, for example, whatever is generationally or genetically (?) at work in a family, and then there is a teenage pregnancy. Usually, the situation is not an isolated event. More often than not, the mother also had a teenage pregnancy, maybe an aunt or a grandmother or a sister… There is always someone else. Same goes for lots of familial patterns. One would think that we would learn from our history… But alas. In this example, the girl who got pregnant unexpectedly as a teenager may have, first, just believed, based on her familial/generational examples and patterns that this is just what girls do. Then, she may need for forgive whoever (mom, grandma, aunt) for teaching her (not explicitly) to get pregnant as a teenager, and she may need to forgive whoever else was involved at the time of pregnancy, maybe even (generationally) the men that would have been involved. The list of people and feelings that need to be forgiven can go on and on. EPTworks helps to pin-point the exact time period and people involved that established a negative pattern and forgive the specific issues related to the pattern in order to move on and heal completely. Other patterns that might exist? Cancer, suicide, abuse, divorce, or addiction… What and who do you have in your life that you know you need to forgive for establishing negative belief patterns in your life? I hate to admit this to myself, but I do the exact same things to others that I hate. If I believe I am alone or unloveable, then maybe I will push people away, or be a regular downer (making no one want to be around me). I will do things to others that potentially could make them feel unloved or alone. In my negative selfish pattern, I end up doing to others what someone else did to me, and them blame them?! What is wrong with me? Like forgiving myself is present oriented, forgiving other is past oriented, giving others permission to forgive me is future oriented. I am anticipating that I will make a mistake, and allowing the other person(s) to forgive me for all the times I do (from the time of the originating event until the end of time). Where in your life might you be doing the exact same thing to someone else that you dislike or do to yourself to keep negative patterns? Those are three statements that heal everything. Forgiveness crossing time and space, life and death, and all that jazz. 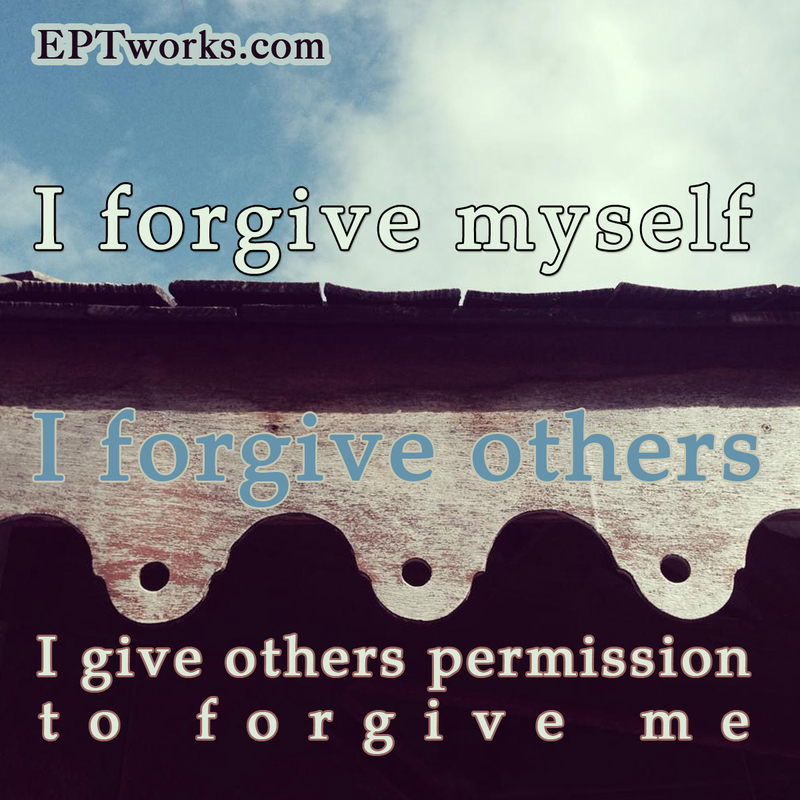 Practicing well-rounded forgiveness is exactly what EPTworks is all about. Not just to heal the past, but to launch you into a happier future.